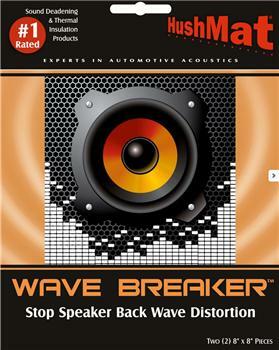 Wave breaker can be used to treat standing wave or back wave in every speaker in your car, truck, boat, rv, office and home. Wave breaker is a synthetic large cell foam placed directly behind the speaker magnet will eliminate standing wave/back wave from that speaker. How is standing wave created? Every speaker creates this wave – when the speaker cone moves in and out waves are created in two directions. The wave that moves out the front is called music. The wave that moves out the back of the speaker is called distortion. This back wave reflects off the solid surface behind the speaker and bounces back to the front essentially throwing the speaker out of phase. When HushMat is placed behind the speaker these back waves are absorbed and broken up in the wave breaker molecular structure. This prevents the bounce back and therefore prevents the distortion. Therefore you get all the music you paid for out of that speaker. Simple to use – cuts with scissors and just peel and stick. HushMat’s incredible adhesive technology makes this product a very simple install.